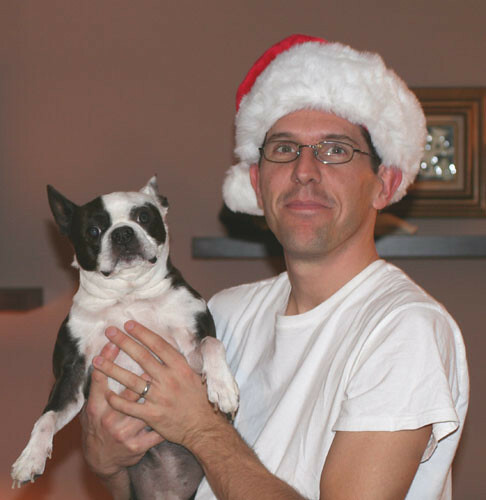 This photo is from Christmas 2007. Five months after this, Bella underwent successful surgery to shorten an elongated soft palate that was making it really difficult for her to breathe. Unfortunately, a couple months later, she was diagnosed with Cushings Syndrome. Bella is doing well; we keep her happy and comfortable. But she does have some hair loss and lumpy skin caused by calcification (a great excuse to dress her in cute sweaters). She also has the typical Cushings pot belly. I'm not posting a current photo because some people may be upset by her appearance. Of course, we love her no matter what she looks like. I didnt know a dog could get cushings. I had to look it up. the pictures i saw of other dogs with cushings didn't look that bad, a lil pathetic,but still cute! that has to be hard to deal with, im sorry. What an angel baby. I'm so glad to hear she's doing well. Hats off to you for giving her the love she deserves.